In late November the Amazon Kindle Voyage e-reader received a massive firmware update. 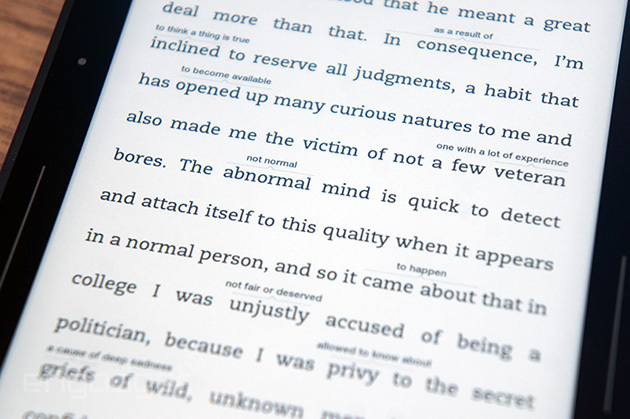 It brought new features like Kindle Family Sharing and Wordwise. What exactly are these new features all about? Today, we give you all a comprehensive hands on review of all of the new features found in the biggest Kindle update ever. Wordwise is basically a thesaurus of sorts that superimposes itself in the books you are reading. It gives alternative meanings to words such as “rampart” or “idiosyncrasy” right on the page that contains them. Family Sharing is a cool option, you can share any content purchased between Amazon accounts on the same e-reader. There is two adults and four children available to share eBooks, magazines or newspapers. One of the cool things is Kindle Unlimited, this a program that once opted in, will allow you to have your kid use the Kindle Voyage and download anything they want, at no extra cost. Parents basically establish a password and say GO! The store and all of the advanced features are locked out, so the child can only download new books and look at their reading achievements. Finally, I like about the Author. This is a cool function that shows you a picture of them, and other books they wrote. If a book you are reading is especially compelling, you can opt into being notified via email when a new title is available. In addition, you can mark the book as currently being read on GoodReads. There are a ton of other updates included, in this video we go over every single one of them. If you are sitting on the fence, not knowing if you should buy the Voyage, you might be swayed over with everything you will witness today. You and I must have different tastes. I see all the features Amazon is adding to epaper Kindles as little more than distractions and clutter, as illustrated by the picture with this article. Do I really need my Kindle to tell me that “abnormal” means “not normal”? Still worse are the books themselves. Kindle books either look drab (feature-impoverished Mobi) or they cost so much to hand code (proprietary KF8) that few publishers bother with the latter. The result is an ebook that looks little different from those on Palms over a decade ago. Look at your own example photo. It’s badly formatted and dull-ugly. And current ebook Kindles have lost a major feature that my Kindle 3 has. They won’t do text-to-speech. There are a host of times when reading isn’t possible or easy. Serious is sickness is one. A few years ago, I was so sick, all I could do was lie in bed miserable and listen to an ebook I already had. I was far too sick to get up and download an audiobook. And for walking, jogging or some commuting, text-to-speech can’t be beat. And no, that’s not made up for by offering audiobooks from Audible that synch with the text. They’re not always available and they always cost extra. That, if fact, is probably why Amazon killed text-to-speech. Maybe you actually feel the same. Generally, when a reviewer talks about something being “exciting” or “cool” it’s because there’s actually little that’s useful about the product. Gush words have to substitute.